Funny how a tiny discarded scrap of felt can lead to a creative journey. This journey began when cleaning up my work area finding this scrap, thinking that the colour looked like honey; which brought up the thought that bears like honey. A little musing happened next, turning the scrap this way and that, wondering if there was enough for a very tiny bear or two. As it happened, after a a lot of juggling , it made four. They are very small. I have a daughter who adored bears from an early age . As these little ones emerged it very much led to a ramble down memory lane. 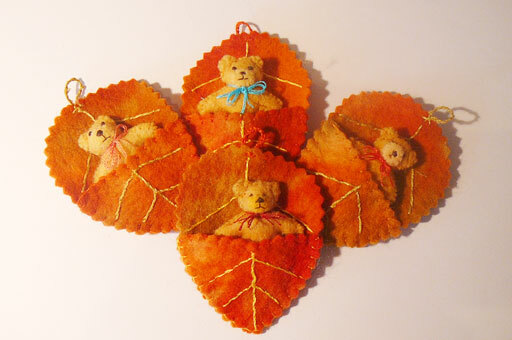 We both share a love of miniatures, so it was even more pleasurable to make these knowing it was just the kind of little bear that would still delight her. Once the little bear was finished it really needed a safe place to hang out, a place to snuggle down as winter approaches. Autumn is the time to prepare for that long hibernation. It is the time when little bear needs to eat up as much as possible to store enough fat to carry through till the weather warms up. It is also the time for Mama bear to find a safe, cosy cave to shelter them. This idea of Mama bear tending to her young made me think of how she might make a little snug place for her cub, a spot that a little bear could curl up on, perhaps a soft bed of grasses and leaves. 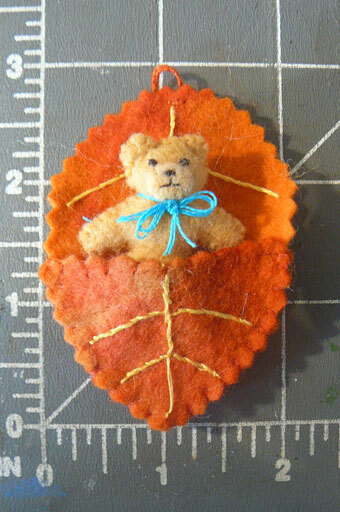 Thus a little, autumn leaf bed seemed to be just the right thing for this tiny bear to dream of sunshine and summer frolics as winter rages, securely wrapped in the warmth of a mother’s love. Thankyou,they were a joy to do.